My first exposure to whitewater play was a 3-day commercial rafting trip with my husband Steve and our good friend Carl. We became white water adrenalin junkies when we got to paddle the rapids in Duckies. What a hoot! We came back to Denver (through a raging 4th of July snow storm) ready for more, and signed up for a three day Intro to Kayaking class with Boulder Outdoor Center. 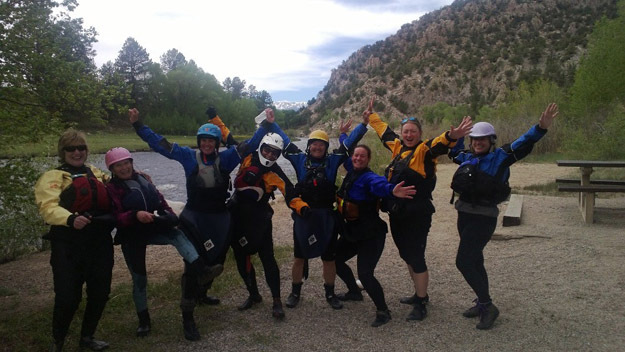 The next season we found Colorado Whitewater, took their introductory class, and began kayaking with a great group of boaters. That was 20 years ago! While Steve took to kayaking with a fanatical intensity, I was a bit more bashful - rolls would come and go and my kayaking career took backseat to other cool things, like having a baby and raising that baby into the great person she is. But whenever I had the chance to get back on the water, I’d feel like I was home, energized, alive and in the zone. With the help of some great instructors, and more time on the river, my skills improved. I consider myself a solid class 3+/4- boater, and I am happy with the challenges this water provides me. My favorite runs are on the Arkansas, the Idaho Springs town run on Clear Creek, Shelly’s Cottages in Lyons. Epic trips have included kayaking in Ecuador, the Grand Canyon, Middle Fork of the Salmon, and Yampa rivers. Colorado Whitewater has been such an important part of my life, connecting me with wonderful people & providing so many good opportunities to improve my skills, boat new runs and have fun. For these reasons, I wanted to give back to the community. While I love getting all of my students hooked on safe, fun kayaking, I especially enjoy working with women and children. I obtained my ACA certification in 2011, and have been a volunteer instructor for the club for the past two years teaching introductory classes and Boating Betty’s. I also instruct kids with AVID 4 Adventure and am looking forward to teaching the CW Kids class this season.